Well, I dont see any water. Often times we struggle whether to remove a cabinet or a wall just to "look" behind to see if water or mold got back there. Often times customers question why we have to remove certain items. This picture is a great example of why we have to get into certain areas, because if we miss this or you miss this, you will have a major mess on your hands down the road. Items against the walls can lead to Mold ?? Sometimes, items that are against the wall can prevent air from circulating enough which can lead to colder air between the item and the wall. This situation can cause higher humidity and lower temperatures that can cause mold growth to occur when left unnoticed. Roof damages can cause all sorts of problems even in the garage, SERVPRO of Antioch is always ready to assist you with your mold and water damage needs whether you are in Antioch, Brentwood, Discovery Bay, Oakley or Pittsburg. Estimates are always free during regular hours. A photo from a commercial warehouse fire. Did you know that soot is a combination of everything in your home that combusted, plastics, synthetic materials, natural materials, etc. Soot can be dry, or wet, oily, and messy. Specialized tools and products are needed to remove soot from surfaces. Fire is a devastating event. This picture shows the effect of the heat on a washing machine 2 rooms away from the origin of the fire. The remainder of the home was not much different. SERVPRO of Antioch had the pleasure of working on the Antioch Historical Museum when they suffered a major rook leak that damaged two floors on the corner of the building. 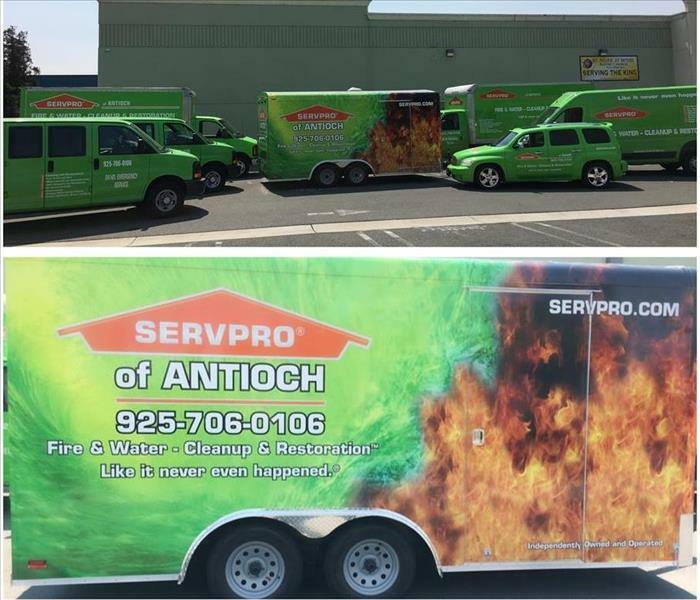 At SERVPRO of Antioch, we are ready to handle any sized disaster. From a small leak to a major flood. From a small smoke loss to a major fire. From a concern for mold to a large mold problem, SERVPRO of Antioch is ready to handle your loss with the right equipment, people and time. We are ready and waiting to respond 24 hours a day. Whether you have a residential property or a commercial property, we have you covered.